Wedge wire screen is a multi-functional screen that we are uniquely positioned to supply. 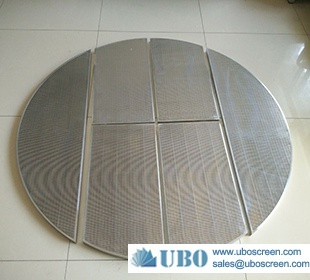 This is a multipurpose screen with characteristics of toughness and clogging resistance where slit / slot (mesh) suitable for the application are formed by arranging "wedge wires" with a triangle shape at equal intervals. They can be used for filtration, solid-liquid separation, classification, dewatering, concentration, etc. regardless of industry or location. Less clogging, good dewatering and the " triangle shape" is the biggest feature of the wedge wire screen, means that as solids pass through, the contact points are small and the tips of the slits are widened, such that solids are less likely to clog, and even they do clog, there is a strong backwashing effect, resulting in excellent maintainability. ①Screen formation with wire diameter larger than the slit is possible. ②Because the screen surface is smooth, the degree of wear is constant. ③The standard material is stainless steel (SUS304, 316L). Broad flexibility in design Because many processing variations are possible, Wedge Wire Screen can be manufactured in various shapes such as flat, cylindrical or conical.